The HD-9SWX is the DIYer's super-tall, double-vehicle storage and service solution. Store two vehicles on four runways. Available with casters, drip-trays, jack platform and more. BendPak hit the nail on the head with this one. So many customers were searching for a lift that lifts two cars at the same time. The BendPak HD-9SWX is unlike the traditional parking lift. For those users that are looking for an affordable alternative to expanding your parking area or garage, we've got this new car parking lift from Bend Pak. Bend-Pak is always in front with innovation and quality. BendPak manufactures some of the most technically advanced automobile lifts in the industry. Are you looking for an economical answer to finding increased parking space? Are you looking for a true commercial quality four post garage lift that won't cost a fortune but doesn't sacrifice quality? If you answered yes to either of these questions, then you need one of the BendPak HD-9SWX commercial-grade double wide home / hobbyist four-post lifts. These garage lifts are perfect for the car enthusiast who wants to be able to store and service his vehicle without spending an outrageous amount of money, yet still maintain high quality. The Bend Pak HD-9SWX is a commercial quality 9,000-lb. capacity lift that works just as well in a commercial parking facility as it does in a home garage. The double wide design means you can store two vehicles side by side on 4 runways, up above two other vehicles. The extra lifting height that it provides means that you'll be able to park taller SUV's and pick-ups underneath. It has all the quality and safety features of the single car HD-9 four post models, but doubles up your parking capabilities. The HD-9SWX is the high rise version of this lift. If you are looking to go wide, but keep it standard height, consider the HD-9SW. Double lifter - The benefit of going with a double wide parking lift instead of a single four post model is it takes up less floor space. Plus, there's less clutter, because there are 4 less columns. It's like have two lifts, but takes up less room in your already cluttered garage. Trying to compare this Bend Pack four post lift with others out there is like comparing apples and oranges. Every Bend-Pak 4 post storage garage lift is designed to be stronger, safer and easier to use. Bend-Pak really went the extra distance on this lift. They started with their previously popular four post home / hobbyist lift, and improved on it immensely. How? By giving it the quality and safety features of a true commercial grade four post lift, yet still maintaining a price that is within the budget of most home users. This just shows that Bend Pak is always a step ahead of the competition. Dual-hub cable sheaves - Most manufacturers use single hub sheaves. Using dual hub sheaves may cost a little more, but means greater longevity. Plus, all pulleys are double diameter. This significantly extends the life of your cables. When you buy BendPak, you get premium features found only on commercial quality models. Durable powder coat finish - The powder coating process used on the all XPR series lifts is superior to others in that it is a meticulous process that takes 10 steps to complete. First, all components are inspected to ensure they are clean before being sandblasted. After sandblasting, all components are washed through 5 stages of huge phosphate tanks that can handle parts up to 25 feet long. Once cleaned, the parts are dried immediately to prevent rust. Then, the components are Out-gassed, which is a process that pre-bakes the components in an oven to prep for coating. Many systems take a shortcut here. Doing that could cause problems with the final coat, including imperfections like chipping and bubbling, which is common on many inferior models. High temperature masking tape and silicone plugs are then used to cover any holes or components that need to be covered. Next, all components are given a thinner wipe to remove any possible prints or debris that could have occured. After that, they are suspended on an electro-statically grounded conveyor line. and an electrostatic spray gun applies the powder. Finally, the parts are cured in 400 degree ovens for 3/4 of an hour. Color Options - The standard BendPak color is Gunmetal Gray. BendPak offers red, black or blue at an additional cost. Custom colors available for an additional fee as well. *Not all BendPak lift models meet the standards as prescribed by ANSI/ALI ALCTV-2006 or ANSI/UL 201.  Contact ASEdeals for a complete list. Notes: An air supply (minimum: 30 psi / 3 CFM) is required for the safety-lock mechanisms to disengage. It is solely the responsibility of the end-user to provide, install and maintain the air supply. 110 volt power unit available at no extra charge. Please specify when ordering.